Happy Friday friends!! I hope you are all having a great week! I wanted to whip up a quick post all about getting "Pinspired" this year with your fashion. I was horrible towards the end of 2012 when it came to putting myself first and treating myself to something to look a little more fashionable. When Christmas rolled around I found myself dressing the kids in all their cute new holiday outfits and had absolutely nothing for myself to wear. Can anyone else relate to this? I knew then and there that I really needed to start putting a little money aside to buy a few items for me and to make a better effort to treat myself to a few outfits in 2013. In sticking with my New Year's Resolutions, I bought myself a few cute outfits that I could dress up or down. I am all about stripes, skinny jeans, scarves, chevron, statement necklaces and boots these days and that is pretty much what I bought. 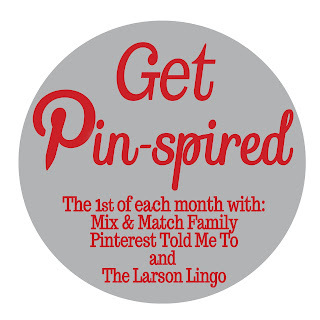 I am also excited to be linking up today to three of my favorite bloggers Pinterest Told Me To, The Larson Lingo and Mix and Match Family. They have teamed up together to host this fun linky party and I just knew I had to be a part of it somehow. I have to admit I feel a bit like I cheated because the point of the link up was to find an inspirational outfit on Pinterest and try to recreate it with an outfit in your closet. My approach today is a little backwards, I found pins on Pinterest to match the only two photos I have taken lately wearing a few recent purchases. You will have to forgive me, it's been a rough month with teething, ear infections and viruses!! I am on the verge of a mental breakdown in the lack of sleep department. Next time I will try to be a little more prepared although you know how unpredictable and crazy life can be with a teething baby! Yikes! And here is an adorable chevron top I purchased from Kohl's for only $19! I really need to invest in a full length mirror in our room. Target sells a leaning mirror that would be perfect for our room, however, leaning mirrors with crawling Infants and Toddlers, I am sure do not get along. I am usually not a big Kohl's shopper but another thing I am trying to do better at lately is to expand my horizons and to look further than shopping Target's clothing session. Don't get me wrong, I LOVE Target's clothing but I really need to add a little variety to my closet as well. Since Target is one of the only stores that I actually am able to take both babies too, I have found lately that pretty much all of my clothing budget is spent at Target. I also purchased this adorable striped sweater dress from Old Navy a few weeks ago that I wear with tights and boots. It was the perfect outfit to wear to Disney on Ice. I hope you had fun glimpsing into my new and improved closet for 2013! I also purchased a few cute items at the outlet malls a few weeks ago that I can't wait to show you. For more "Pinspirational" outfits, you can follow me on Pinterest or if I actually got dressed and did my hair that day, on Instagram. So happy that you linked up with us today. LOVE that chevron top. I don't actually have anything chevron, but I need to! I have the SAME dress from Old Navy!!! My aunt gave it to me! I haven't worn it...yet! Love your chevron shirt, so cute. I haven't been to Kohl's in months! Need to go :) Thanks for linking up!! I think both outfits are great. I am also working on building a wardrobe and styling myself more. I really like how this link up and Pinterest inspire trying new things with what we have. Oh and I am finding most of my purchases lately coming from target, which is a change from before I had kids. Love your striped dress and chevron top!! I love that striped dress! you look so pretty in it! You look awesome Karen! love that top from Kohl's. I don't go there often but I know they have a great clothing selection when I do. I like both of those outfits. You look so slim, and nice. Love the chevron top....looks great!